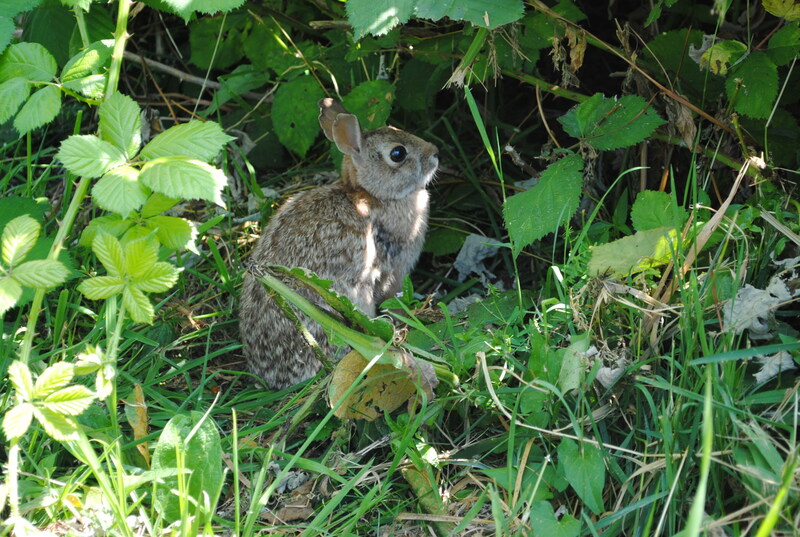 The cottontail rabbits who live at the Abbotsford Community Garden are small and abundant. We seldom see less than two. In the evening, it’s not uncommon to see ten or more of them scurrying about the garden plots. They find it easy to wiggle under the edge of loose fencing or through the spaces in the wire. Sometimes they even chew through plastic fencing to get to a tasty crop. This year, the bush bean and carrot plants were popular, eaten into oblivion, in fact. With gardens galore to choose from, a high perimeter fence to keep out coyotes, and lots of bramble patches to live in, Abbotsford Community Garden is a cottontail paradise. I found this nonchalant cottontail rabbit at the edge of the bramble patch. Some are so very small and cute that you want to pull a carrot or two for them to eat.